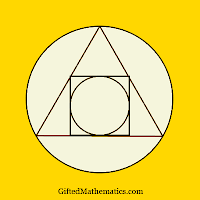 The diagram is an alchemical symbol, reminiscent of a cosmogram or mandala. The interplay of the triad and tetrad within two circles leaves this open to numerous interpretations. However, this is the only construction that allows for an equilateral triangle; I have seen versions with an isosceles triangle. One decoding of this symbol is to start at the smaller inner circle, designating our normal state of consciousness. The square then represents the distillation of the four elements, with the triangle signifying the three realms of existence; such as body, mind and spirit. The larger circle is the end of the great work; an expanded consciousness. Note that the centre of the larger circle is also above the centre of the smaller one. However, let us leave behind such neoplatonic meditations on moral geometry and concentrate on the purely metric. 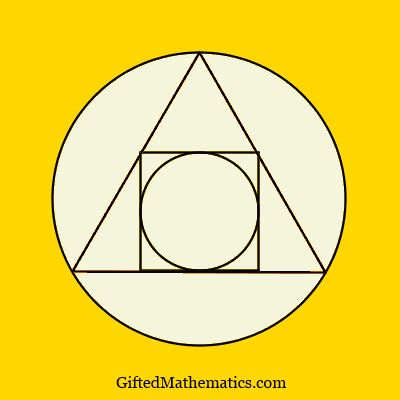 Given that the smaller circle has a radius of unity, find the radius of the larger circle. Also, calculate the distance between the centres of the two circles. Send your complete solution by email to pmq21green@giftedmaths.com. This email address shall be removed after the competition closes to avoid spam. This PMQ21 competition closes on MONDAY 3 June at 23:59 GMT - one extra weekday from now on.